Early explorers thought the downy, brown penguins were a new species. The explorers described the odd looking creatures as “woolly” penguins. 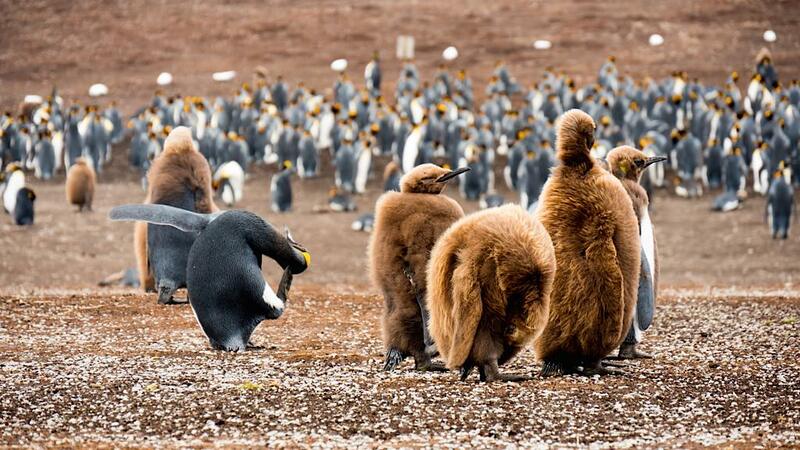 They are, in fact, King Penguin chicks. © 2014 Avid Travel Media Inc. Yesterday, I wrote about how you’re not likely to see King Penguins in Antarctica and how many people are surprised to learn that they will not see large penguins at all once they reach the White Continent. What you will see in Antartica are smaller penguins — primarily the Chinstrap, Gentoo and Adelie. Antarctica does have Emperor Penguins, but cruise ship visitors rarely see them because the largest species of all penguins are found farther south than most ships visit. In fact, some of the Antarctic experience takes place on the way to Antarctica or back, either in the Falkland Islands, where this picture was taken, or in South Georgia, abundant in marine life, including King Penguins and variations of seals. So the first thing you should know about Antarctic cruises is that are variations. You can do the shorter variation, usually 10 days roundtrip Ushuaia, that crosses the Drake Passage, visits Antarctica for six days, then returns to Ushuaia. Or you can do a longer cruise, two weeks or longer, that visits the Falklands and/or South Georgia. These are two of the typical itineraries, though there are more. I recommend the longer cruise for a number of reasons. First, you’ll see more varieties of wildlife than you will see if you only visit Antarctica. And second, getting to Ushuaia takes some effort. If you’re flying into Buenos Aires, for example, you’ll need to change airports, and the two are about an hour apart, so you will need to deal with the logistics of changing airports. Then there is the nearly four-hour flight to Ushuaia. The two-week or longer cruise, on the other hand, allows you to cruise directly from Buenos Aires, which is what we did on our voyage on Seabourn Quest. If you choose that version, there is the added bonus that you’ll stop in the Falkland Islands, where you can snap photos like the one above of the King Penguins.